Talk about wood paneling and furs, this room has both! The structure of the room is predominantly wood, with the cream cushioned sleigh bed at the center. 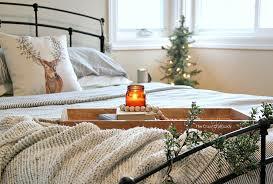 On the bed are thick sheets and furs, mix of pillows the color of cream and coffee. At both sides of the bed are tables with large lamps, cream colored frames with pictures and potted plants that give the room character. The windows have cream shades on them. 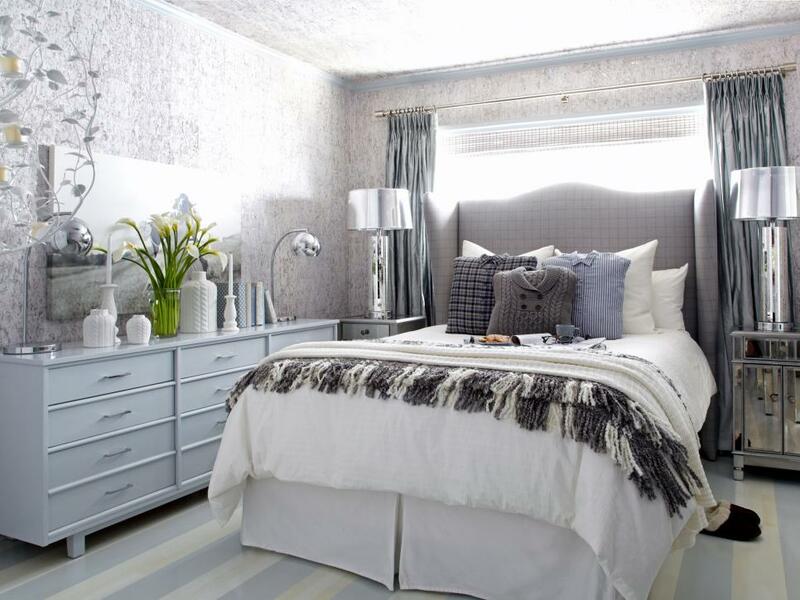 A dark hued room with walls the shade of black and grey complimented by a mirror on one wall and black and white artwork on another, just above the bed's cream cushioned headboard. Focal point of the room is the half tester bed with grey and dark coffee sheets and pillow with the only thing breaking the monotony is a white knitted bed runner. Black shades cover the windows with a white lamp providing lighting to the room. Wonderfully wood paneled walls and a tree stump side table but everything else is covered in white. Blankets, sheets and some of the cases on the pillow sport snowflake designs in white. Other pillow sport fur cases. White Christmas decor like small Christmas trees and ferns finish off the winter wonderland feel of the room. A winter wonderland white bedroom with a queen size bed with metal head and foot rests, a bracket on the wall above the headrest, a crafted bedside table, a display glass panel and a rustic glass chandelier. All in white. Meaning white paint, white sheets and what not. 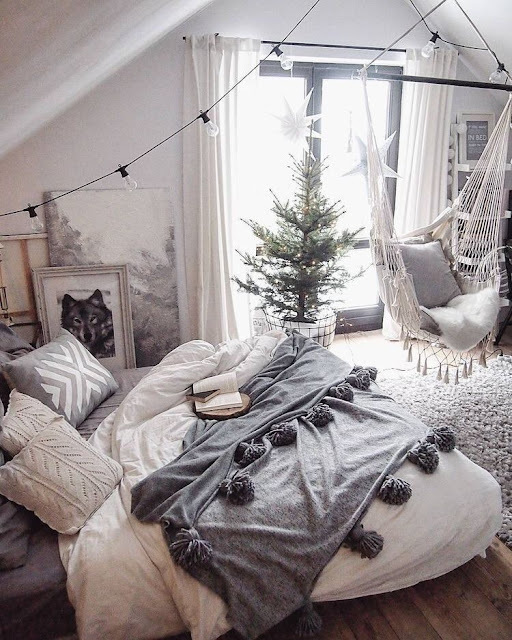 The only color in the room is the wood grained wood at the foot of the bed, on it are potted yellow flowers, the green wreath hanging from the wall bracket by a ribbon and the white decorated Christmas tree in the corner. A room primarily of white and grey. A mix of white and grey sheets and pillows on the half tester bed, a white beside table with a white lamp on top, white walls and white curtains.The only color that highlights the scheme are the Christmas decor touches which are the red bed runner with Christmas designs, the red candles on the side table, the reindeer themed pillow and the decorative red reindeer bust hanging over the bed. Simplicity is the key as a touch here and there is enough to transform the space. The rustic theme just oozes from the space as white washed walls compliment a dark stained half tester bed and side table. A mix of white, red, cream and coffee colored blankets, sheets and pillows highlight the bed's coziness. All the while the fur carpet on the dark floor, the antique candle lamps, the green fern in a vase on the table and the black star hanging above the headboard highlights the mix of dark and light. A design perfect for cold nights and mornings. Mainly a white room with a dark stained side table. The platform bed, painted white, is where regular and knitted sheets and pillows of a mix of white and light blue shades rests. A design that is easy on the eyes and can lighten anyone's mood during the cold winter months. Just a perfect cabin room. Coffee, cream and white color schemes for the mix of fur and regular duvets and sheets on the platform bed; The heavy coffee drapes the disallow light from the windows; The coffee colored fur rug gives the space a nice, comfortable feel to it. At to that a small metal room furnace and viola! Warm winter nights. Focal point of the white walled room is the wood grained trundle bed and stone fireplace. On the bed is a mix of red checkered and cream sheets and pillows with two wood grained side tables with white lamps framing it. The ultimate Cabin Room! Wood everywhere including the platform bed with white sheets and pillows. In front of the bed is a cream fur rug. The unpolished stone fireplace provides warmth for the space. Lighting comes from the hanging ceiling fan and the white lamp on the dresser at the corner.